Have you got a tough job ahead, either because your machine is too lightweight or because of challenging geometry on the part (deep pockets, for example)? If so, maybe Plunge Milling (also called Plunge Roughing) is the answer. What are Plunge Milling’s Advantages? Twist drills often have much higher material removal rates than endmills. Most CNC Machines have Z as their stiffest axis. By changing forces from side forces (XY plane) to axial (Z) up and down forces, we get much more rigid cutting. Taken together, it’s pretty easy to see where Plunge Milling could turn into your Secret Weapon. Perhaps you have a relatively lightweight or less rigid machine. By taking advantage of the greater rigidity your machine will have in the Z direction, you may be able to get higher Material Removal Rates. Or, you may be able to overcome a chatter problem that’s due to a lack of rigidity. Older (or cheaper) CNC milling machines that have more slop in the XY axes, less precise interpolation, or slower spindle speeds may also benefit from exercising the Z-axis more via Plunge Milling. Plunge Milling seems tailor-made for the limited rigidity and performance of Hobby CNC machines too, for example. And speaking of a lack of rigidity, Plunge Milling can be ideal for those really deep pockets where side forces are causing so much tool deflection you can hardly make progress at all. Sandvik says Plunge Milling is advantageous any time overall Tool Stick out is more than 4 x Tool Diameter. How about a Mill-Turn situation where your live tooling is not nearly as rigid as on a pure milling machine? Here again, you may find Plunge Milling is just the ticket. Plunge Milling can also be just the ticket when your machine’s spindle power is limited, according to Sandvik. Talk about a lack of rigidity–long reach and thin walls make Plunge Milling a natural for this 5-axis turbine application. Image courtesy of Hypermill. Another way Plunge Milling can help overcome a machine’s limitations is when spindle speed is limited. Plunge Feeds and Speeds may be a little slower than straight up high speed machining. But, if your spindle rpm is the limiting factor, you may not be able to take full advantage of HSM. If that’s the case, Plunge Milling is even more likely to give you the best Material Removal Rates. How about machining a tall thin wall? This is a notoriously chatter-prone situation that may be partially amenable to Plunge Milling. It’s not a total cure, because you’ll still have to manage a finish pass that removes the scallops, but it might allow higher Material Removal Rates without chatter for the roughing pass. In fact, consider Plunge Milling any time chatter becomes a big problem on a job. One last special case for Plunge Milling would be corner clearing. When the depth of the corner is greater than about 4 x the cutter diameter that fits into the corner, rigidity issues develop. Aside from special cases, some shops report that Plunge Milling allows them to do roughing on older machines in the shop that might otherwise go unused. They keep their newer machine centers busy on jobs the older machines can’t do, and over shop spindle utilization goes up. That means more profit. I like the idea of Plunge Milling for Lights Out Machining too. It seems inherently more conservative and less prone to problems like whether coolant is aimed properly or not. Plunge Milling Corners. Image courtesy of Sandvik. One could imagine doing most of the roughing with an HSM Toolpath and an endmill that is much to large in diameter to get into the corners. Depending on pocket shape, this can clear most of the material without leaving much scalloping. As part of the final finish or an intermediate Semi-Finish pass, we use a much smaller diameter endmill to clear the area of the corner and then we can make an overall finish pass of the entire wall of the pocket or profile. Plunge Milling leaves scalloped edges which may take a fair amount of cleanup or a semi-finishing pass before a true finish pass can be applied. Image courtesy of Sandvik-Coromant. Scalloped Edges: Plunge cutting leaves a scalloped edge (see diagram above) that will have to be cleaned up by a finish pass. Depending on your X and Y stepover amounts, the amount of scallop to be removed could be significant. 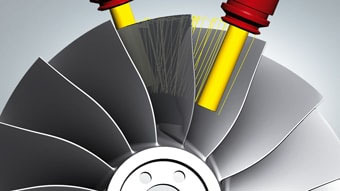 If it’s more than a single finish pass can remove, an optional semi-roughing pass will be needed to clean up the scallops before the final finish pass can be applied. Center Cut: The tool used must either be center cutting (leaves out many types of indexable endmill) or the toolpath must allow for a ramp or helix entry to create enough space to start taking partial plunge cuts. If the tool isn’t center cutting, it also can’t cut on a down slope where the feature gets deeper in some places. 2D vs 3D Plunge Milling: Some Plunge Milling toolpaths only support 2D features where the floor is at the same Z, while others can do full 3D Profiling via Plunge Milling. 3D Plunge Milling. Image courtesy of SprutCAM. 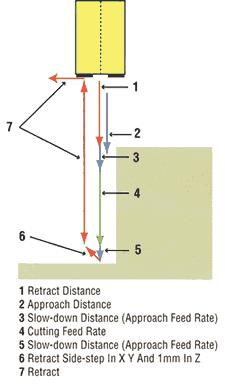 Conventional Twist Drills: The point angle on conventional twist drills makes them wander when plunge roughing if the holes overlap too much. You also wind up with a scalloped floor, which is less desirable. This may require flat-bottom tooling such as endmills or twist drills that are specially made for Plunge Milling. Not the Best Under Favorable Conditions: Plunge Milling is not a general-purpose strategy that replaces all other strategies. It’s best use is when you need Plunge Milling’s advantages: more rigidity and less power required. 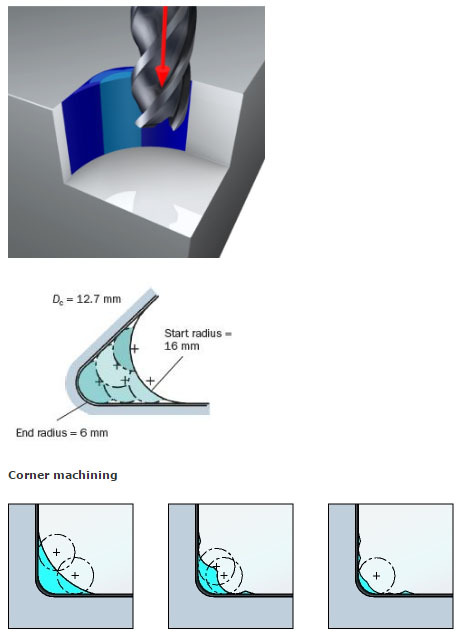 If those are not problems you need to solve, then Plunge Milling is probably less optimal than other Roughing Strategies such as a High Speed Machining (HSM) Toolpath. Our first task is to decide on the X and Y stepovers. Sandvik recommends starting with a stepover (Cut Width in G-Wizard) of 80% of cutter diameter for the sideways motion of a single pass. 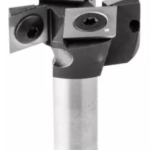 The stepover to move deeper into the material for the next pass is limited by the insert diameter or the maximum Cut Width of any non-center cutting tool. 80% of that value is a good choice as well. Keep an eye out so there’s no skinny stalks sticking up in the corners between the holes. If you see stalks, you need less stepover in one dimension or the other. Now we need Feeds and Speeds. 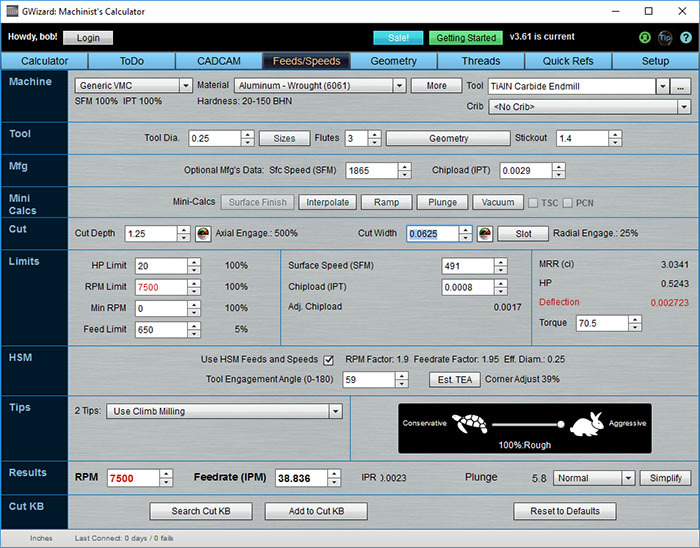 Our G-Wizard Feeds and Speeds Calculator has special features to help with Plunge Milling. 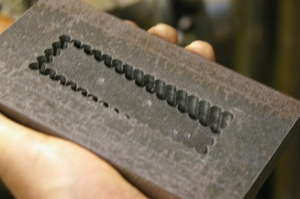 Let’s work through an example that shows the strengths of Plunge Milling. Suppose we are handed the task of roughing out a pocket that has 1/8″ corner radii, which dictates and endmill no larger than 1/4″ in diameter. Next, suppose that pocket is 1 1/2″ deep. I can already hear the groans out there in the audience–a pocket that deep with such a small endmill is likely to be a bear! The MRR isn’t bad at 3 cubic inches/min, but deflection is way too high. This approach is going to chew up tools very quickly with almost 3 thousandths of deflection. A quick click on the “Cut Width” label has Cut Optimizer taking us all the way down to a Cut Width of only 1.4 thousandths and there’s still a bit too much deflection. We could probably live with that, but MRR is down to a lousy 1.1 cubic inches a minute. We’re going to lose our shirts on this job if we don’t find another way. What about Plunge Roughing? G-Wizard’s Plunge Milling Calculator let’s us enter a Step Up (amount to move into material at start of each pass) and a Step Over (amount to move laterally from prior hole on the same pass) and adjusts the feedrate based on those parameters. Here’s a case where Plunge Milling shines: our MRR is back in the 3 cubes a minute territory of the original HSM scenario, and while the Deflection error is still red, we can ignore it because we’re plunging and there will be no significant deflection while doing that. Which CAM Packages have Plunge Milling? As far as differences in Plunge Milling toolpath quality, it’s worth checking on whether your CAM package supports two capabilities. First, does it do true 3D or just 2D Plunge Milling? 3D is obviously much more general while 2D will only work for flat-bottomed features. Retracting from the Wall slightly during each Plunge Rough stroke can improve tool life by 10 to 15 percent, according to the developers of the technique. What Can I do if my CAM Software won’t Plunge Rough? 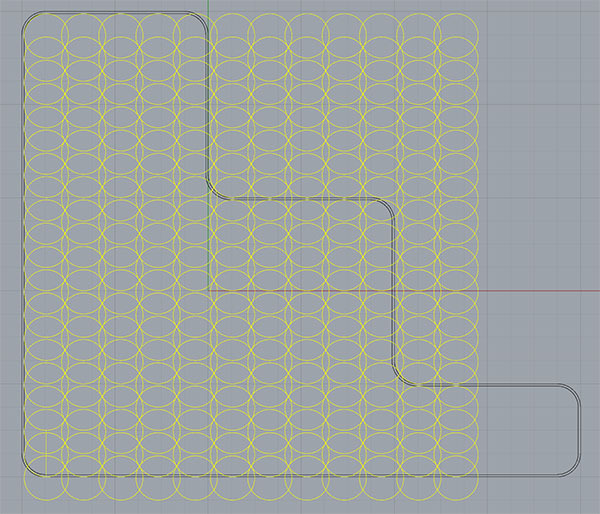 Use your CAD Software to generate a grid of holes (circles or whatever you like) within the contours of the pocket or other feature’s outline. Be sure to leave some finish allowance, so you may need to inset the outline by the finish allowance. Depending on how easy it is to keep the circles entirely within the outline, you may have to inset further to leave enough allowance. Your CAD software does most of the work, so you’re relying on its sophistication to pull off the creation of the hole grid. 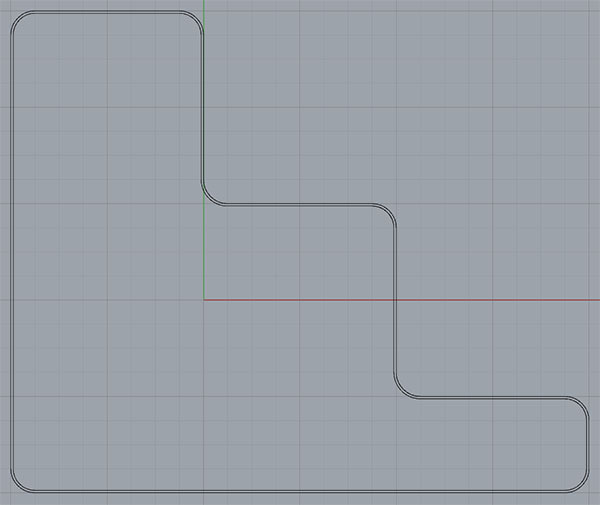 Even if the package is a bit weak in this area, most of them should be able to lay down a grid within a rectangular region or perhaps in a line so you can Plunge Mill a slot. 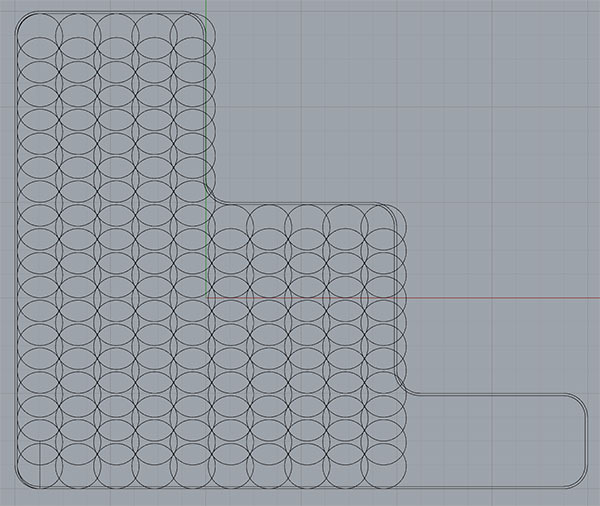 Given the grid of circles, you create a g-code program to plunge the cutter at each circle’s coordinates. This can be as simple as taking a canned drilling cycle and feeding it the list of circle coordinates. There are certainly embellishments. For example, you could do the fancy wall retract move with a little bit more hand coding. You may also need to deal with entering the pocket, though you could use just have your CAM package generate its entry and then cut and paste that gcode to create a starting point for your Plunge Milling routine. With a little bit of gcode programming familiarity and some decent chops with your CAD software, this is not hard nor does it need to take very long. I didn’t get the grid quite large enough! That’s about all there is to it. 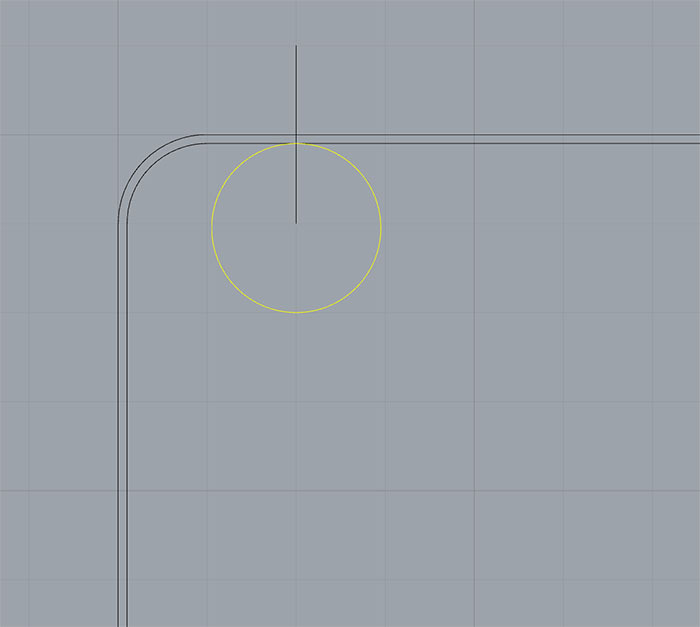 You now have a CAD drawing that shows where the holes for the plunge strokes need to go. Import it into your CAM package and treat just like trying to drill all those holes. It’ll generate the gcode which you can then further tweak as needed. 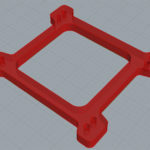 I didn’t finish with the CAM part, but the CAD work only took 10 minutes and I didn’t use any shortcuts. It’s not hard to do if you want to play with Plunge Milling a bit. Programming something like this to clear a corner or two would be even easier. G-Wizard makes it easy for you to evaluate which one will perform best for your jobs given all the variables that are in play. One shop found that button cutters (round insert indexable tooling) worked especially well for their needs. Normally, Plunge Milling Specialty Cutters use flat-bottomed inserts, but the round inserts were much less prone to chatter than the flat-bottom inserts. 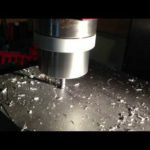 One thing to be careful of when Plunge Milling is any cutting near the center of the tool. Many indexable tools can’t cut in the center and many end mills are also not center-cutting. That means you’ll have to plan your stepovers so no center cutting is called for. You may need to create a starter hole with a drill (indexable or otherwise) to avoid center cutting issues. The technique worked and allowed a Bridgeport to open up a lot of material quickly. But, there are disadvantages. Twist Drills don’t like overlapping holes and interrupted cutting too much, so mind your stepovers accordingly. No more than 40% overlap can be tolerated if the drill has a conical point, and even this much can lead to a lot more wear. This may or may not lead to good Material Removal Rates, so this is another case where experimenting with a few scenarios in G-Wizard can really help refine your approach. Also carbide twist drills don’t like the shock associated with plunging too much. HSS or indexable tooling may be a better bet. Another issue with Twist Drills is the holes are not flat bottomed. There are versions available that are flat bottomed, both indexable and solid, so consider those. Otherwise, you either want a through situation (a hole not a pocket) or you’ll have quite a lot of finish work to do on the scalloped floor of the pocket. Like I said, Plunge Milling can be a powerful secret weapon in your CNC arsenal. It’s still not in wide use, so your competition may not have this secret weapon. 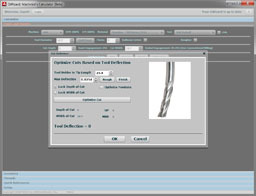 We’ve seen its advantages graphically via G-Wizard in the case of a pocket that’s too deep relative to tool diameter. Take advantage of our free 30-day G-Wizard Trial so you can work on your own scenarios too! Do you use Plunge Milling? Tell us your experiences and thoughts on Plunge Milling in the comments. I’m using SprutCam 10 and I’m not aware of any Plunge Roughing Operations. Mark, just click the link by the photo. It leads to the page in the Sprut docs where the photo came from. Drills do not like it when side brake into other hole, End mills have no problem. If drilling should leave 1/16 inch web and then use end mill to remove web. 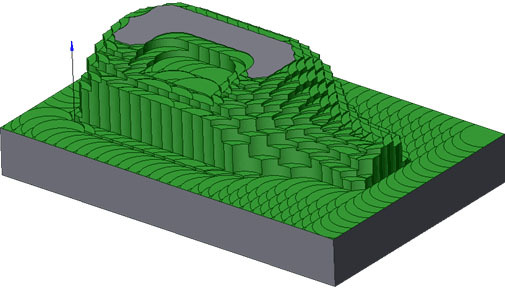 I’m trying to figure out by visualizing in my head, why would plunge milling be an improvement over milling in layers on the Z-axis (aka contour milling or topographic milling)? It seems to me, and correct me if I’m wrong, but the time would be about the same, but contour milling would wear down the tip of the bit faster than the rest of the bit and you would still get some deflection along the x and y axes. 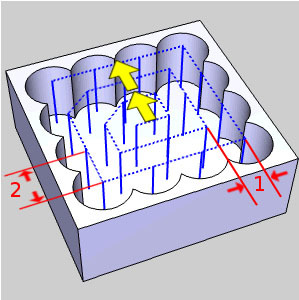 With plunge milling, the only deflection would be along the Z-axis. Also, it seems like plunging is fine for roughing only because of scalloping, but which method do you think would make the smoothest result for the final pass? There’s just so many options! (I’m new to CNCing if you can’t tell). Jason, plunge milling is advantageous only when rigidity is a problem due to either the machine being a bit too lightweight, or the required tool diameter being too small relative to the cut depth. That’s really the point of the article is to spell out when it is a better bet. Plunging is only suitable for roughing, and if you’re leaving a reasonable finish allowance, the roughing method shouldn’t affect the quality of the finish from the final pass. I suppose it is possible to imagine a situation where the rigidity problems are so challenging that they continue to exist during the finish pass and that the scalloping could potentially make that worse, but in the end, I think it only means there will be multiple finish passes required. If rigidity is not an issue, other methods, such as HSM style toolpaths will achieve higher material removal rates and efficiencies. 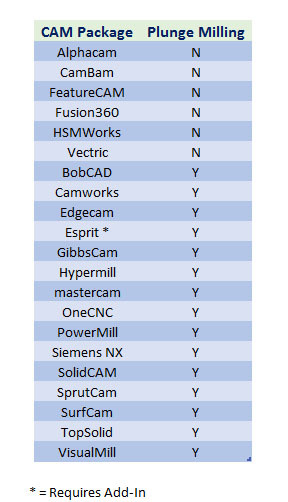 In your article; Which CAM Packages have Plunge Milling? 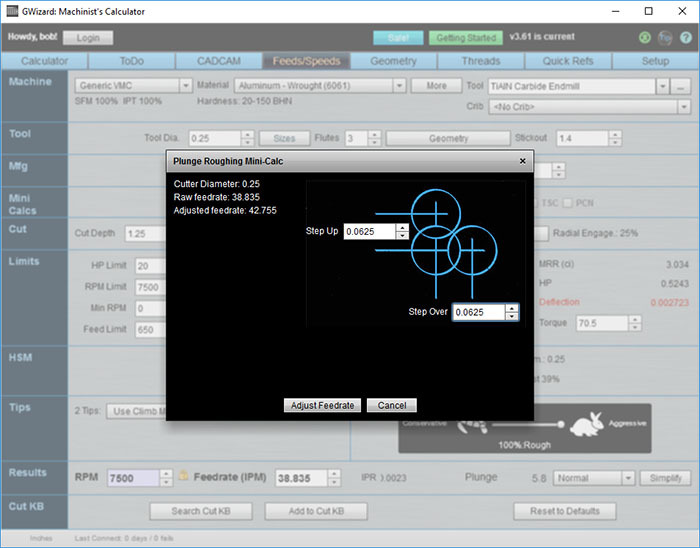 – I am curious why you say Vectric software has no plunge option when there is a place to entire plunge rate in the tool database plus there is a roughing toolpath option for 3D milling. Rob, you can see which packages have Plunge Milling in the same table where you saw I said Vectric didn’t. Their roughing toolpath for 3D is not a Plunge Milling toolpath. And plunging is a common operation. It’s one way to get a tool into the cut, so I am not surprised there is a place for it in the database. Cool! Another tool in the toolbox on how to approach a problem. Thanks to all for the ideas. Hi Bob, nice article. One thing though, is you listed FeatureCAM as not having plunge milling. 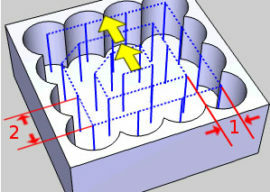 FeatureCAM definitely has plunge milling, and has done for years. It’s not under the 2.5D feature options, but rather is available as a surface milling feature strategy, and so supports 3D plunge milling (and therefore 2.5D if you give it a model). Catia also have 3D plunge operation as a Roughing strategi, but was not mentioned in your list. Nice article! Thanks! 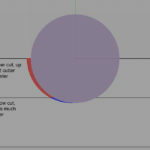 However, I noticed one thing – plunge calc results depends on cut depth. Shouldn’t it be, that in plunge roughing vertical feed rate doesn’t depend on the depth of cut, but only on stepover? Why with increasing depth of cut feed rate is decreasing? Many thanks. Paul, you still want to slow down. The longer the engagement, the harder everything has to work to extract chips and keep the tool cool. I made long semi-deep slot and didn’t use CAM. Simple G-code progmamming is effective. 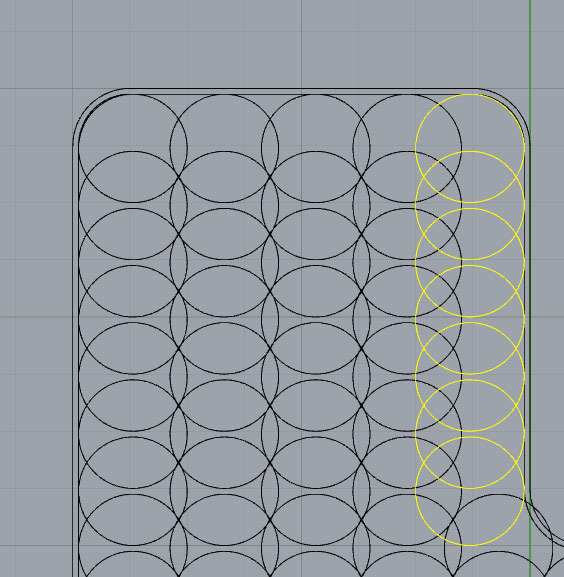 Using CAD in a trial and error manner to fit the holes, results in larger than necessary stepovers for all but the last hole. Why not just calculate the offset which gives an equal stepover on all holes upfront? D is the tool diam. in general (unless the stepover is correct first time) the value of N will not be an integer. We can correct that by rounding N upwards for a smaller stepover or round down for a greater stepover. Just as with the trial and error method you need to repeat this calculation for both axis and the different areas of the pocket if it is not a simple rectangle. Oops. The last expression should use N1 (the integer value) in place of the N that I wrote. Silly typo. Oops. I made a typo in previous comment. In the last expression N should be replaced with N1, the integer value. We can not drill a non-integer number of holes. Oops, I made a typo in previous comment. In the last expression the ‘N’ should have been ‘N1’ the integer value.